Ecostream Irrigation is a Hamilton based company specialising in the design and manufacture of high quality farm dairy effluent products which are sold throughout New Zealand and Internationally. Most of our comprehensive range of products are designed and manufactured by Ecostream Irrigation and have been accepted as the industry standard. Many have also won prestigious NZ National Fieldays Society Inc. Awards for which we are extremely proud. During the decade since our business was established, hundreds of systems have been designed and installed throughout the country. Ecostream products deliver innovation, superior performance, reliability, value for money and enable farmers to get the best value from their effluent. This comprehensive, easy to follow website is to help you understand our products, their features, benefits and uses. We trust that the information it contains will assist you with your planning, design and product selection and will also serve as a reference point for the future. We look forward to assisting you in any way we can. Farm dairy effluent is a valuable fertiliser and if spread onto pasture correctly will increase pasture production and reduce solid fertiliser requirements. Other benefits include improvement in soil organic matter levels, soil structure and soil water holding capacity. For a well managed Ecostream Effluent Irrigation System, the cost savings in fertiliser use will provide an excellent return on investment and will typically pay for the capital cost of installing the effluent system within 3-7 years. 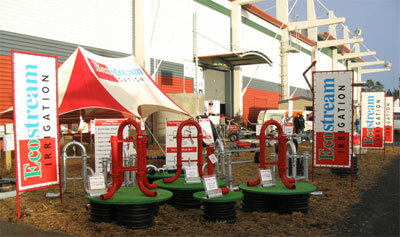 2008 Ecostream Irrigation Ltd. All rights reserved.